Sears Garage technicians can help you take care of all of your garage door needs. We provide you with everything from installation to replacement and repair. Ask us about our warranties, which are some of the strongest in the industry and our special financing offers. Give us a call at (413) 376-5440. Express your unique sense of style with a new garage door. Whether you love beautiful windows, traditional doors, or carriage style doors, we can help you find and then install a set of doors that you will love. Get rid of old, ugly, or broken garage doors with the help of Sears Garage replacement services. Our technicians can help you find the replacement doors that meet your family's needs. Sears Garage Doors have some of the strongest warranties available. Most people only think about their garage door when it stops working. Broken springs, bad sensors and other garage door issues do not have to slow you down. Sears Garage repair can get your garage doors working again. If your garage door opener malfunctions or breaks down, replace it with a new Craftsman opener, from Sears. Craftsman openers offer a full range of features, including remote smart-phone operating capabilities, battery backup and motion sensing door control that turns on the lights automatically when a person enters. Sears Garage Doors are available in a variety of styles and colors. 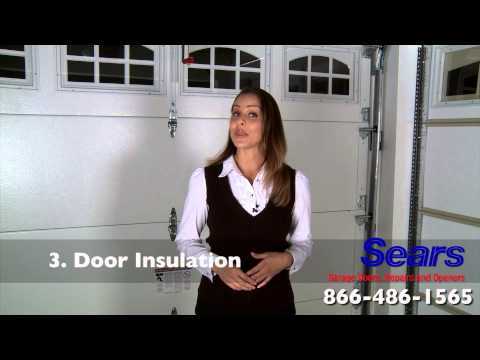 Learn more about our Sears Traditional and Sears Carriage House Garage Doors. We offer both steel or wood garage door options so that you can decide what will look best with your homes architecture. Sears Garage Doors also offers insulation options that will improve energy efficiency and offer noise reduction. This is especially important with attached garages and homes that have a bedroom over the garage. Ask about our wide selection of Sears garage door accents including windows and hardware. Visit www.searsgaragedoors.com to use the Sears "Door Designer" program and design the garage door of your choosing. You can be proud to own a new garage door from Sears. Our garage doors are made with great attention to the details, using only the best and safest products to ensure your complete satisfaction. Sears offers new garage doors, garage door repairs, and garage door openers with installation. Call Sears to schedule a free in-home estimate or visit www.searsgaragedoors.com today and use our Garage Door Designer tool to design a door specifically for your home. Replacing a Garage Door? Sears Garage Doors offers a variety of colors and styles for your new garage door. Whether you are looking for a high quality, well-insulated garage door or a basic garage door, you will find what you are looking for with our traditional garage door selections. For your convenience we offer free in-home estimates and knowledgeable sales associates to help guide you in selecting your new garage door. Call 866-362-7933 to schedule and appointment or visit www.searsgaragedoors.com for more information. The technician was thorough and pointed out any plainly visible repairs which also needed to be repaired. His advice saved me time and money in the long term. All went well and it is fine now. Service rep was prompt and professional.